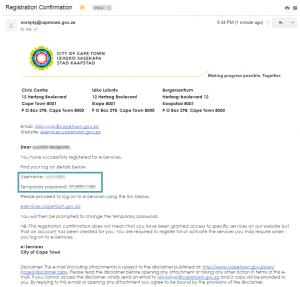 City of Cape Town has changed the car license renewal process quite a bit. 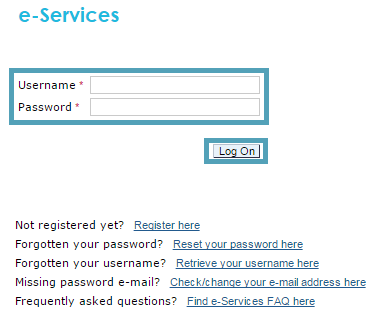 It looks like they’ve changed it for the better as you now have a central login for all the city’s e-services. It is also more secure as you will only be able to renew a car license that is registered to your I.D. number. I still think it is secure, but you can renew other car licenses as well. Download the PDF of this AWESOME tutorial to follow in your spare time. Now you need to fill in your details. Note: Your username is changed to upper case once you click the Register button. Once you have filled in all your details, ticked the data privacy statement and clicked Register, you will be redirected to the Registration successful page. 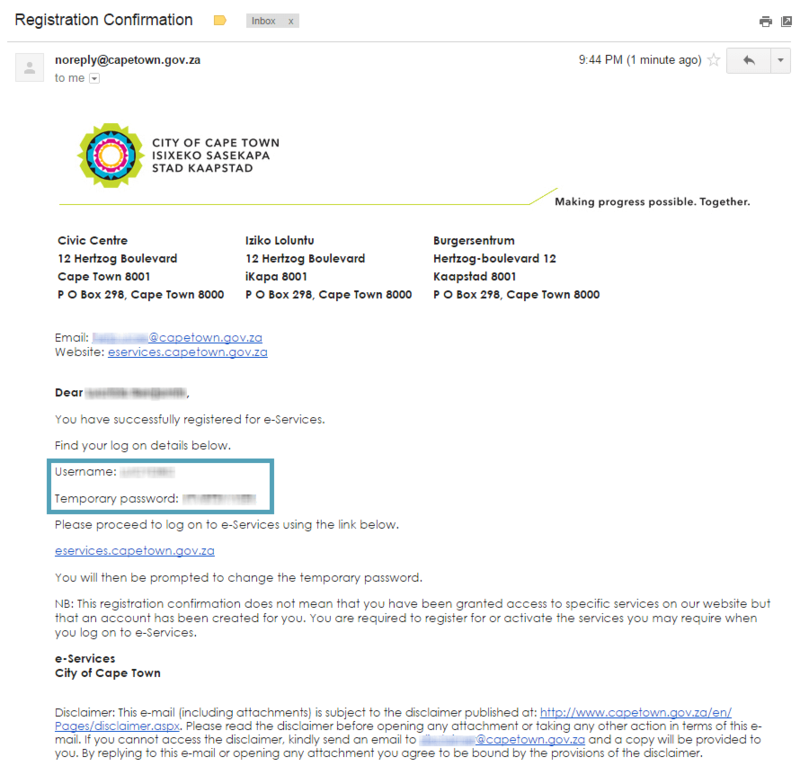 You can click the Close button and open the email from noreply@capetown.gov.za. Note: You will need your username and temporary password from this email. 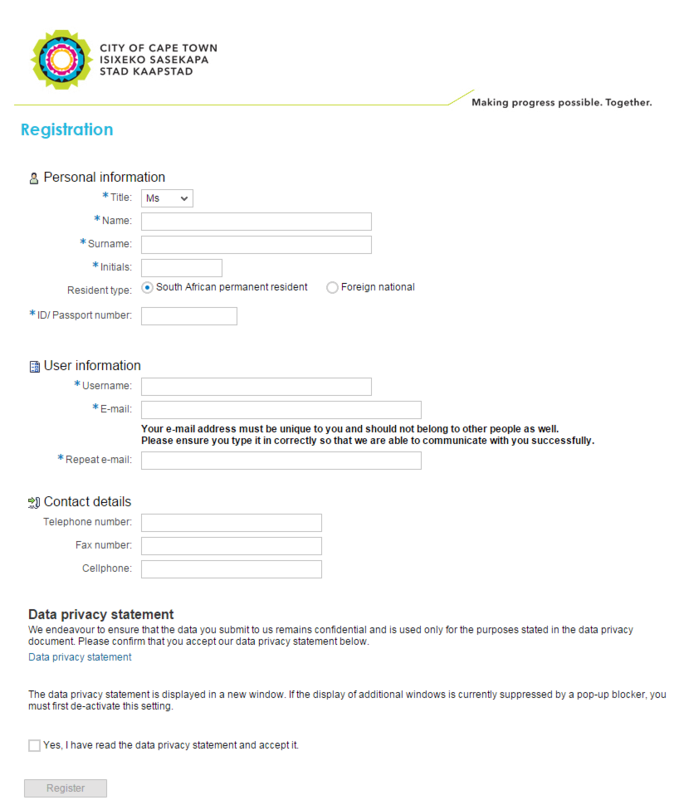 Now go back to eservices.capetown.gov.za, this time filling in your login details and clicking the Log on button. Now choose a different password. Remeber to use your temporary password as your old password. Once you have clicked the button to change your password you will be redirected to the Welcome page. Click on the Service Activation link on the left menu or in the welcome text. 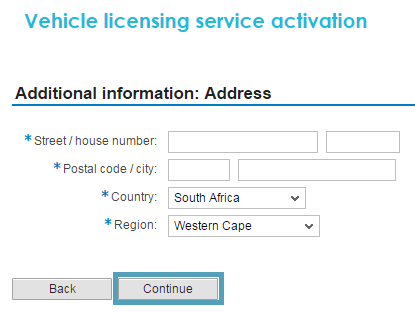 Click on the Vehicle licensing Activate service button. In the next section click the Continue button. 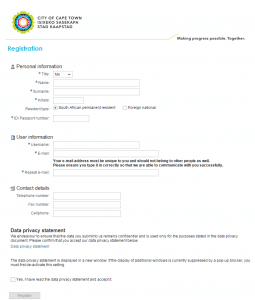 Note: You can ignore the Registration information section unless you have a Business partner number. Fill in your address then click the Continue button. 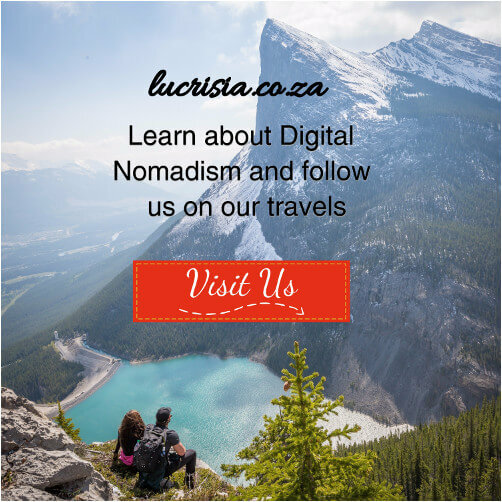 Upload a digital copy of your I.D./Passport and click the Continue button. Accept the digital privacy statement by ticking the checkbox and click the Submit button. Note: Write down and keep the service activation reference number in a safe place. You will see that the Vehicle licensing service says In-Process. You will now have to wait 2 business days for the email with instructions to make payment. I received an email today (1 business day after applying) approving my application for the Motor Vehicle License Renewal service. Follow step 2 again and login with your details. 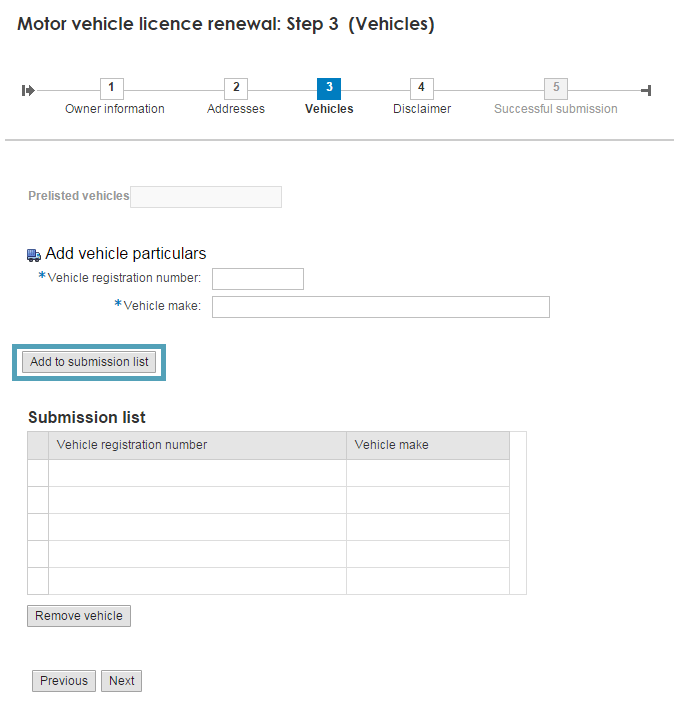 Click on Motor vehicle licensing above the left menu. Click on Renew motor vehicle license. You are now on step 1 of 5 steps. Fill in your information if it is not there already then click the Next button. You are now on step 2 of 5 steps. 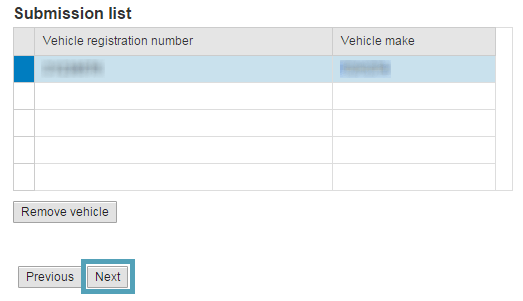 Fill in the vehicle owner’s address information then click the Next button. You are now on step 3 of 5 steps. Fill in the Vehicle registration number which is the License number on your MVL1 form, your Vehicle make (Toyota, Mazda, BMW, etc.) and then click Add to submission list. You are still on step 3 of 5 steps. Once your vehicle is on the submission list click the Next button. You are now on step 4 of 5 steps. Accept the Data Privacy Statement and Disclaimer and click the Next button. You are now on step 5 of 5 steps. Congratulations, your submission was successful! 🙂 Remember to keep your reference number safe. I received the email requesting payment the very next day! 🙂 Efficiency! I paid on the 27th of September and on the 5th of October they sent my new license. I received it on the 14th of October.If you do not receive your license within 13 working days of payment(It seems like it takes them 5 business days to process payment so you should factor that into your waiting period), you should call 0860 10 30 89. Speedy, efficient, effortless and an absolute pleasure! What are you waiting for? Go ahead and try it! Thanks! That really saved me a whole lot of time. Instructions much appreciated. Hello Kurt. Your first two links does not work. Did not try the rest. The first link might be due to you being registered already when you copied the link for your post i.e. the website allowed you in on that page. When I click on it it wants my login details. Might always be a good thing to have a separate machine to test your tutorial after creating it. The separate machine will not have all the login details stored on the machine created while you where figuring out the tut. Try a Ubuntu LTS 14.02 boot DVD that way you don’t need a separate PC. Hi, To which address do they send the licence to? 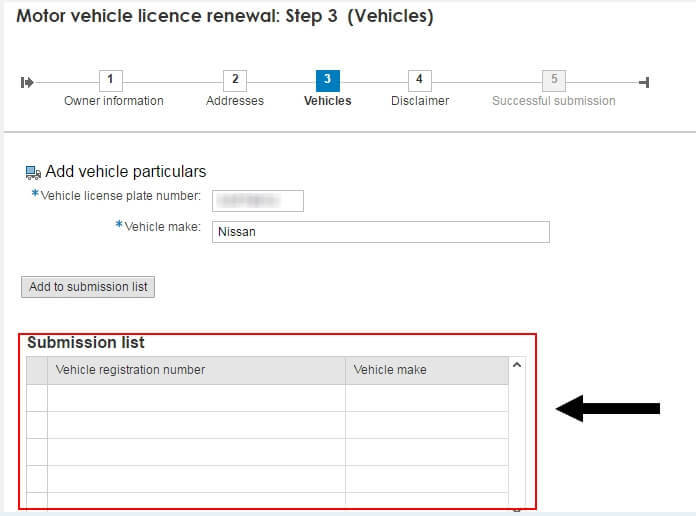 Is it the one you specify in in step 12 in the registration process, or the address of where the car specifics are given? 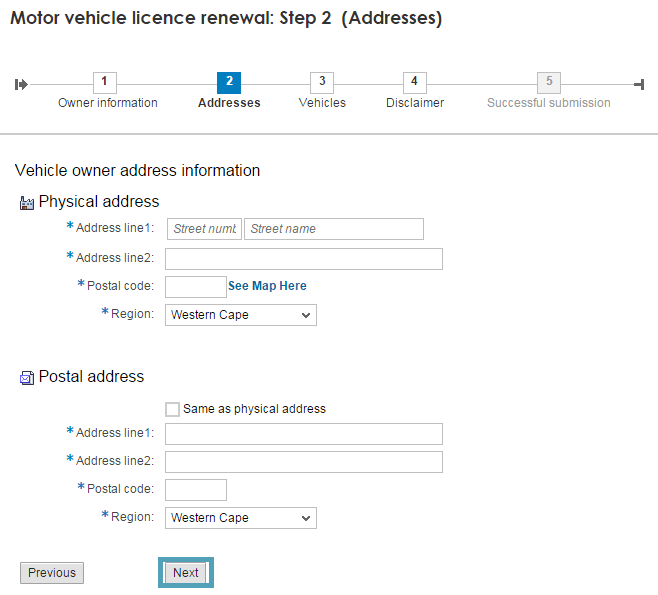 They send it to the address you specify in the Motor vehicle license renewal: Step 2 (Addresses) section. 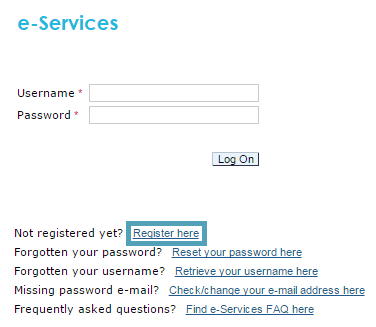 each time i have used this e-services website, it doesn’t work, am I missing something? I’m trying to register for vehicles, it takes fooooooorrrrreverrrrr?? Whats going on? Of course, their help desk is not exactly eager to respond. Which step are you getting stuck at? Hi Kurt, I have successfully registered for eServices to renew my car license. 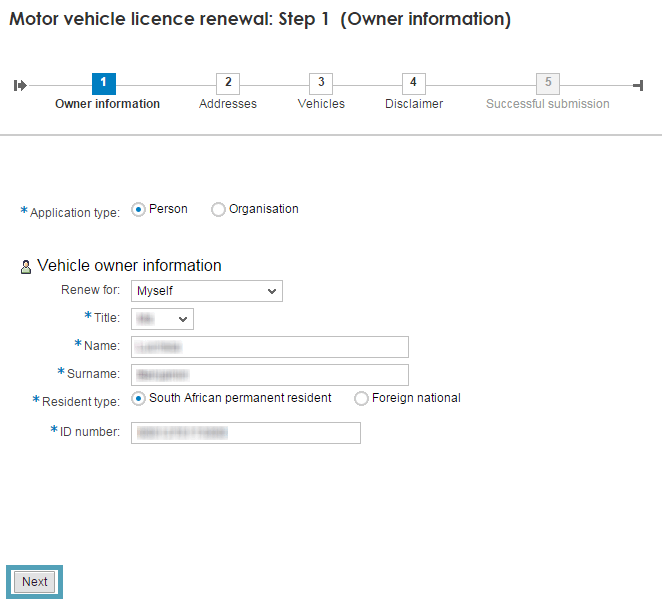 However on the “Renew Motor Vehicle License” Page step one I am stuck. Its asking for a 13 digits “traffic Register Number” – which I notice that on your wonderful detailed instructions you don’t have it. I cannot find this number on my certificate or other documentation. Can you please let me know where I can find this. I know this is late, but this is what I found about the traffic register number. I cannot get further than renew your licence on line as it says Problem loading page. Have tried Firefox and IE – absolutely frustrating as I had already registered for e services some time ago. I just cannot login. Help please!!! That’s no good. Have you tried using a different PC? Include a detailed description of your problem together with your Business Partner (BP) number, your ID or passport number and your e-Services username where applicable. Hi Kurt. It does in fact work from the i-pad, but still doesnt work from PC. It just wont load the page after clicking on Register. I have sent many emails to help.uces@cape town etc and they keep telling me to go through the steps, but I CANT!!! Surely it cant be Firefox or IE that is the problem, and Im not clued up enough to understand what the problem is. Thanks for your response. Ive solved my problem! Changed some settings in Firefox (pop ups!) and now it works! 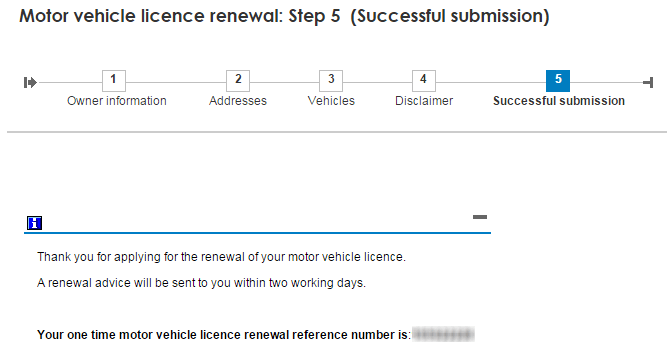 Hi Kurt, I have gone through the process as far as completing the 5-steps for vehicle licence renewal. However, It is now 5 days later (inclusive of a weekend), and I still haven’t heard anything further. The status of my request remains at ‘New’. 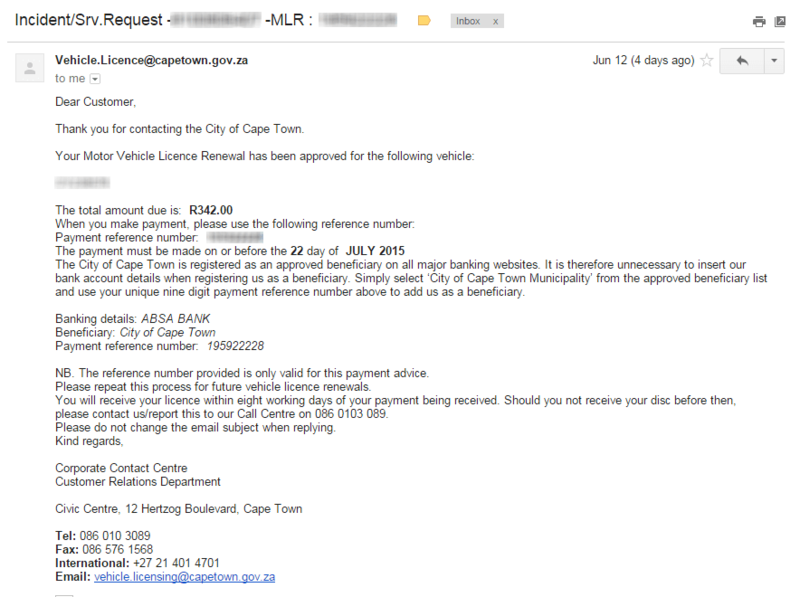 I have sent 2 emails to vehicle.licence@capetown.gov.za (yesterday and much earlier today) and although my emails have been acknowledged through an automatic service, I have heard nothing. I am in danger of my licence expiring after 21 days! Please can you suggest something further I can try? Thanks very much for your very useful post. Have you called 0860 10 30 89? Don’t worry. You have a 3 month grace period if you applied for the license before it expired. Just remember to keep proof of your application with you. It does seem to happen in the end – but much longer than a few days! Although I still haventactually received my licence in the post. I read in the paper last week that the City is encouraging people NOT to try to renew online at the moment, if your licence expires at the end of the month, as the POST OFFICE do not have the capacity to deliver all the licence discs in time.They say rather go to the Licencing Departments at the moment. It would be cool if we could apply online and then collect the license at the nearest traffic office. Hi, I have registered and activated the services. I have loaded my application 5 times now and am still non closer to getting closer to actually renewing my license. I cant get to the page when you need to upload documentation. I have unblocked pops, changed browsers. Any ideas? Beyond frustrating. Have you tried using Firefox and disabled it’s popup blocking function? Which step of the Service Activation are you stuck on? Remember it takes about 2 business days for them to process your application. All they should require is the Beneficiary name which is City of Cape Town. Are you adding the City as beneficiary first before trying to make payment? Have you updated your “how to” tutorials? This is the greatest one ~ VERY clear and the step by step instructions are brilliant. Thank you! This tutorial still works as of 12th December 2016. I requested a password reset but cannot even get past the first step!!!! The tutorials first step, as in you don’t live in the Western Cape, or the password reset first step? If it is the latter, what is the error message you are encountering? Is the Vehicle register no and the Vehicle registration no the same thing? This comment will help you with the register number. This is not the same as the Vehicle registration number. Im sorry, the reply to this person was incorrect. The Submission button doesn’t work on the 10 browsers I tried, including removal of all add-ons, switched off virus scanner, Different pcs etc.. It does NOT work. There’s a clear bug in the system. I tried Register number, License plate number, every number possible. One cannot submit their vehicle details into the list. 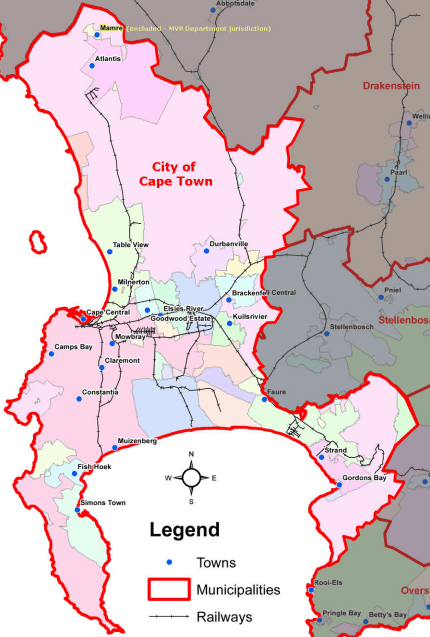 I recommend no one bothering with this – rather get it the old fashioned way – but be careful here too, recently Cape Town motor registration offices have been turning away people for very small issues. I’ve submitted a vehicle below as you can see from the screenshots. I used the Chrome browser and I have a few add ons, plus an anti virus on a machine running Windows 7. Hi Kurt, is this service available for the Gauteng region as yet? Perhaps someone who has tried already could help out here?